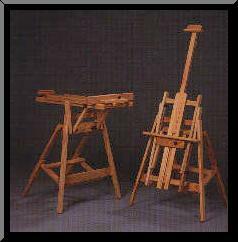 Designed by a portrait painter, this magnificent easel is constructed of hand rubbed oak. The Manhattan's top carriage has a self braking clutch that allows the painter to tilt work forward, backward, or vertical. Adjustable sliding mast moves independently of the tray. 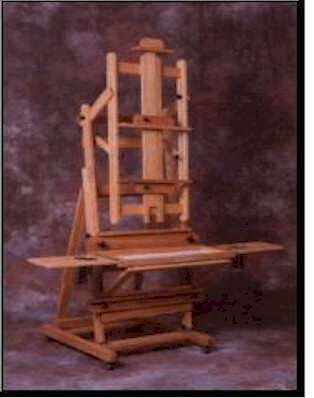 · Can hold canvases up to 84"
· Minimum easel height: 75", maximum height: 110" · Base width/depth: 20 1/2" x 30"
Built of solid oak, this quad base easel is perfect for the mixed media painter. It is inexpensive, compact but sturdy, reliable, and very flexible. 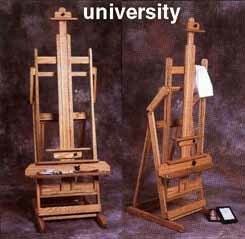 Can be used vertical for sketching or painting, and in just seconds can be adjusted to a horizontal position for watercolor, gessoing, or varnishing. Plus, the Deluxe Lobo features a built in shelf for supplies or books. 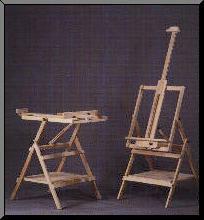 The Manzano features a unique frame design which slides down & locks for seated work: tilts horizontally for watercolor or varnishing; or raises vertically & locks into a higher position for standing work. Made of beautiful solid oak. It can accommodate a canvas 50" high. Adjustable 20" wide painting tray. * Rubber grips on top & bottom tray to keep canvas secure. * Strong quad base. * rubber no-slip tip on base for stability.